For years I collected pictures and images that I hoped one day I could have tattooed on my skin, but at 325 pounds, I always told myself I would get tattoos when I lost weight. For so many years it did not happen. At my heaviest I did not even feel comfortable in clothing that expressed my personality, none the less tattoos that I worried would look misshapen when I finally did lose weight. In August of last year I was 189 pounds (currently about 150), and after dramatically losing my dog, I got my first tattoo in 13 years of Odin's spear Gungir. I share that story here. Before that I had a tattoo on my lower back that I got of my husband's band name, Helvete, and a small shark playing the guitar on my ankle. Today I want to share the story of my three most recent tattoos, all of which I got in March of this year. In one month I went from a few easily hidden tattoos, to a rather heavily tattooed woman. My tattoos represent so much and make me feel beautiful and bold, after years of hiding and feeling like I could not express myself. A butterfly is a beautiful creature that has completely transformed from a caterpillar and can fly! 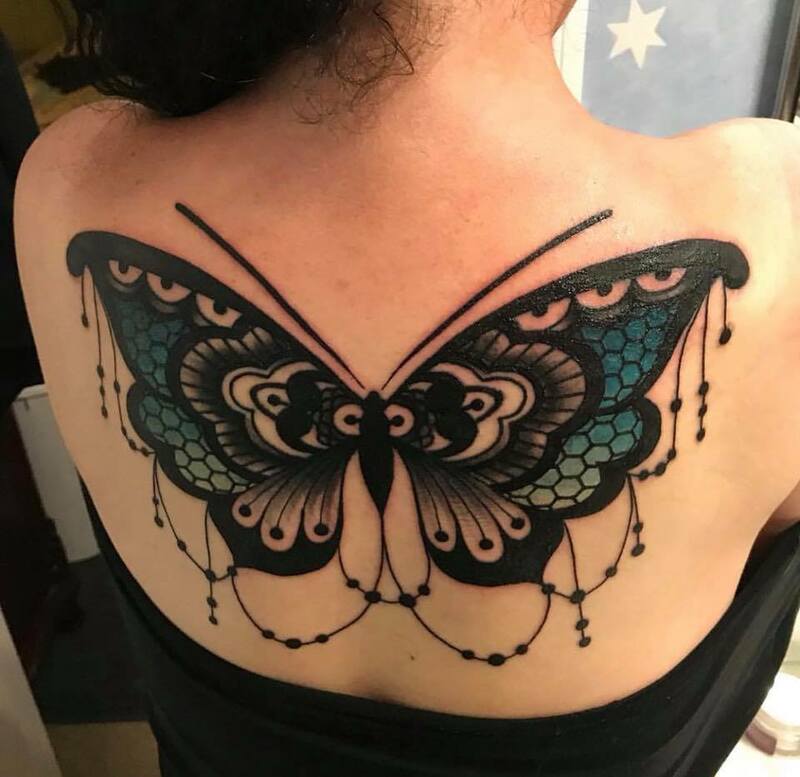 Since I feel that I have completely transformed my life, and now have the ability to do so much I never could before, I got this tattoo to represent my transformation. As a kid, my grandfather collected elephant figurines and told stories of how they represent strength and strong character. My grandfather passed away in 2005 and my husband and I decided to name our son Malcolm after him. My son developed his own love and passion for elephants so I got this elephant tattoo to represent my grand father, my son, and to give me strength. The crown and the mandala were added for my daughter Regan. Her initials are RED. They also represent Ganesha, the Hindu God of Success. September 2018 update to the mandala. Vikings and Norse mythology have always fascinated me. When I shared the tattoo idea of a Norse dragon, the kind that would be carved into a Viking battle ship, surrounded in Aster flowers (September flower, the month both my kids were born) with my friend Verb from Tattood Goat Society, she blew me away with her original design! It is absolutely perfect. I am absolutely in love with this piece! This epicly done, gorgeous tattoo makes me feel like a Valkyrie. Losing weight changed my life in so many ways. It gave me the confidence to get these tattoos I have always wanted. When I look in the mirror now I see the person I always wanted to be and worked so hard to become. These tattoos are an important part of me now. Older PostThe #1 Change I Made to Lose Over 150 pounds- the most important thing!